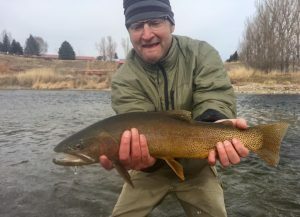 Wind River & Bighorn River Fishing Report: The Bighorn River in Thermopolis and the Wind River in Dubois, Wyoming have been fishing well despite some winter conditions. Both rivers are free of ice for the most part. The Wind River in Dubois is frozen west of town, but is free of ice in town and east of town to the Wind River Reservation boundary. Our guides are still hitting the river and taking trips out despite it still being winter. We are looking forward to another great season, and dates are starting to fill up for the summer. It looks like we will have a regular water year unless our spring changes significantly. We are looking forward to a “normal” year as far as runoff is concerned.